The development of the teeth the person goes on 6-7-th week of fetal life, the child's baby teeth cut with 6-9 months and 6-7 years of age, they are replaced with constants, which differ from dairy form and sizes (Fig. 1 and 3). Only the child of 20 primary teeth. The terms primary dentition: Central incisors appear in 6-9 months; and lateral incisors in 9-12 months; the first molars in 12-15 months; fangs 17 - 20 months; the second molars in 21 - 24 months. Terms teething: first erupt sixth teeth - first molars (large indigenous) - in 6-7 years; then change the Central incisors in 7-8 years, lateral incisors in 8-9 years; the first premolar (small indigenous) replace the first dairy molars in 9 years; the second premolars replace the second dairy molars in 11 -12 years; fangs change 10-13 years. Second molar teeth erupt from 12-13 years, third molars (wisdom teeth) - 15-16 years. Just in adults 32 teeth. To indicate in the history of the location of the patient's tooth (or lack of it, and so on) are dentition formula, where all the teeth have a sequential number, beginning from the middle of the dental arches. The upper arc is separated from the lower horizontal line. Milk teeth in the same order are indicated by Roman numerals. In the tooth distinguish crown, neck and root. The crown is referred to as part of the tooth, the protruding above disneym edge. The neck is a place of transition of the crown in the root. The root of the tooth is immersed in the socket of the jaw. Hard tissues of the tooth - dentin, enamel and cement (Fig. 2). The bulk of the tooth is dentin; in the field of crowns dentin covered with enamel; in the field of root - cement. The tooth has a cavity, the wider the crown, resulting in a root terminal (omega) hole. The tooth cavity contains the pulp, which consists of loose connective tissue rich in cells, here are the nerves and vessels of the periodontium, feed the tissues of the tooth. The periodontium (pariament) - connective tissue, which is located between the root and the compact disc alveoli (see Jaw). In periodontal have a large number of vessels and nerves. Depending on the form of the crowns and functionality distinguish several groups of teeth: the teeth (8), canines (4), the premolars (8), teeth (12). Cutters are wedge-shaped form. Chewing surface of the premolars and molars formed the valley, separated by grooves: premolars two tubercles, molars - four or five. 1 - ganglion semilunare; 2 - a. maxillaris int. ; 3 - n. maxillaris; 4 - n. ophthalmicus; 5 - v. ophthalmica inf. ; 6 - n. infraorbitalis; 7 - v. ophthalmica sup. ; 8 - nn. alveolares sup. et plexus dentalis sup. 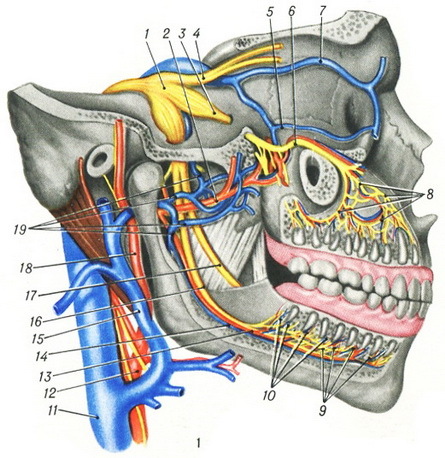 ; 9 - plexus dentalis int. ; 10 - vv. dentales; 11 - v. jugularis int. ; 12 - a. carotis communis; 13 - a. alveolaris inf. ; 14 - v. alveolaris inf. ; 15 - v. retromandibularis; 16 - n. alveolaris inf. ; 17 - n. lingualis; 18 - a. carotis ext. ; 19 - plexus pterygoideus. In the period of formation and eruption of the teeth may be some deviation from the norm. Anomalies of the number, position, shape, size of the teeth and time of the eruption. There are complete absence of teeth (edentulous) and partial. Usually edentulous permanent teeth and less milk. Sometimes formed delayed tooth in the jaw, this phenomenon is called fitted. The anomalies of the number of teeth are additional teeth, which may be located in the dentition or outside of it. The anomaly of the teeth is that individual teeth (often fangs and premolars) erupt out of the dentition. Phenomena retention and anomalies of the teeth often depend on the premature removal of the destroyed milk teeth. Pericolosit - inflammation of the gums, covering the crown of the tooth, resulting in incomplete eruption of wisdom teeth or its incorrect position. There are strong pain radiating to the ear, fever, Scrivania mouth difficult (see Lockjaw). As a complication may occur subperiosteal abscess lower jaw. Treatment. Using a syringe to wash the gingival pocket 3% solution of hydrogen peroxide, a 1% solution of chloramine or 0.1% solution of etakrydina (of rivanol). In the gingival pocket to enter the solution of penicillin. Then carefully inserted into the gap between the gum and tooth gauze strip, impregnated vaseline oil and liberally lubricated with iodoform or impregnated emulsion of streptocide, and facilitate the outflow of fluid and pus. It is often necessary to nadsekat mucous membrane over the hillocks of the tooth and then as the case of a decision about the removal of the eighth tooth it is necessary to make an x-rayto be aware of the position of the tooth in the jaw and the form of its roots. Caries is the most common disease of the tissues of the teeth. Its cause is not clear, however obvious is the need for strict compliance with the purposes of prevention of rules of personal hygiene: at least once a day (preferably overnight) brush your teeth, rinse your mouth after eating. Caries prevention should begin in the period of pregnancy, when the fetus is formed the beginnings of a tooth. Pregnant rational dietthat includes a variety of vitamins. The use of flour confectionery and sugar should be limited. Such a diet prevents caries and mothers. Twice a year it is necessary to visit a dentist for the identification of the early stages of caries. This is especially true for children (see the Sanitation of the oral cavity). Tooth decay is the most affected by the following ages: 3-7 years and 12 to 17 years. Dramatically increases the incidence of caries in pregnancy. The essence of dental caries is that under the influence of microorganisms is the destruction of tooth tissues. The initial form of caries is painless, then at deepening of caries experience pain from irritants. Differential-diagnostic sign for uncomplicated caries is a non-spontaneous pain (from sour, cold, spillage of food), which passes quickly when Troubleshooting reasons. If untreated caries germs get into the pulp and cause inflammation (pulpitis). Pulpitis is characterized long time passing (from 20 minutes to 1 hour) the pain stimuli. The main symptom of pulpitis are spontaneous, paroxysmal pain, especially at night. When the treatment of pulpitis produce necrotization pulp by imposing arsenic paste on the most painful point inside the cavity, the cavity is closed with a temporary filling, but not more than for two days in order to avoid drug periodontitis. In the following technique nekrotizirovanne remove the pulp forest and a special needle with thread (pulpectomies), the tooth canal treated with hydrogen peroxide, antifermion and sealed (see the Fillings). You can remove the inflamed pulp under local anesthesia 2% solution novokaina. If you cannot immediately implement appropriate dental care in acute pulpitis, it is necessary to provide urgent assistance to resolve the acute pain. Into the cavity of a tooth on a cotton wool enter cauterizing (phenol) or anaesthetic substance (powders novocaine, dikaina or anestezina mixed with phenol). Enter in the carious cavity 2% solution amidopirina (in the form of heat). Good antibiotics : penicillin in solution and in the powder, the syntomycin powder, which is injected into the carious cavity in a sterile cotton swab. These drugs are harmless to the mucosa and relieve pain attacks for a few days. The tooth cavity with medicinal substance close artificial dentin. Periodontitis. In untreated pulpitis starts rotting decay, gangrene pulp, the infection penetrates into the periodontium and causes the inflammation of periodontitis (pericementitis): pain when pressed on the tooth (alveolar pain); then the pain is continuous, progressive. Teeth becomes mobile, gums red and painful. With festering all phenomena are amplified, may form an abscess. Sometimes pus finds a way out through the gums at the neck of the tooth or form a fistula, then the inflammation subsides. At occurrence of periodontitis patient should be referred for treatment to the dentist. During treatment it is necessary first of all carefully remove broken the pulp of the tooth cavity and channel. In the presence of a seal is removed. The tooth canal and carious cavity left open to drain fluid. Enter penicillin in transitional fold around the tooth. Designate hot rinse with a solution of baking soda and infusion of sage. External heat is contraindicated, as it leads to the formation of a fistula. Inside - sulfanilamidami and antibiotics. After acute nephritis phenomena periodontitis in most cases takes chronic. Subsequent treatment with the aim of preserving subject to the teeth with well-passable channel; teeth with twisted roots, in most cases, are subject to removal (see the Removal of teeth). In some cases of chronic periodontitis order to save the tooth with impenetrable channel, surgery is the removal of the apex (resection, episotomy). Now apply the reconstructive teeth: extracted from wells tooth after appropriate processing (antibiotics, sealing channel) are put into the same hole. This operation is shown for injuries (pulling a tooth out of a hole when injuries), with anomalies of the teeth and obstruction of root canals. If repetirovali tooth tightly into the hole, then it can be left without additional fixing, otherwise it fix a ligature or bus. Up fully prizhivlyaetsya 4-6 weeks.